The historical accounts of the suffering caused by these and other such diseases are singularly horrifying. Among all of them, however, perhaps none has provoked more fear and horror than rabies. In that regard, it has few peers. 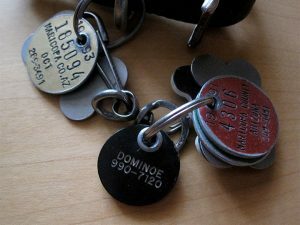 Previously we have written about the importance of pet rabies tags and the scary statistics about rabies; but some of that information bears repeating. First identified at least 4,000 years ago in the ancient Near East, rabies is a neurotropic lyssavirus known to infect only mammals—including human beings—and to kill its host by traveling along neural pathways, up the central nervous system, and finally settling in the brain. Transmission is typically caused by the bite of an infected animal, though it can also occur via passive exposure if the saliva of the infected animal comes into contact with a person’s mouth, nose, or eyes. Once a person is infected, the initial incubation period typically last one to three months; however, it can last as short as a few days or as long as several years, depending on the point of contamination and the amount of viral bodies introduced into the system. Without post-exposure prophylaxis (PEP) treatment, the mortality rate from rabies infection after this incubation period is, for all intents and purposes, 100%. Fortunately, PEP treatment is highly effective and consists of one dose of human rabies immunoglobulin (HRIG) followed by four doses of rabies vaccine over a two-week period. Once the virus has reached the brain, however, all bets are off. There is no cure after that. Worldwide, some 60,000 people die from rabies each year, mostly in Africa and Asia. The remarkable case of Jeanna Giese represents just one of the 10 or so individuals in all the world known definitively to have recovered from the virus without receiving preventative treatment. For all the rest, the prognosis is hopeless and the symptoms are exceedingly severe. At that point, the only treatment is palliative, to lessen the severity of what is bound to be an agonizing demise. As the disease progresses, it causes inflammation of the brain accompanied by insomnia, anxiety, confusion, agitation, muscle spasms and seizures, foaming at the mouth, aversion to light, irritability and aggression, bouts of irrational terror, paranoia, hallucinations and other abnormal behavior, followed by delirium, paralysis, coma, and eventually death by suffocation or cardiac arrest when the muscles controlled by the autonomic nervous system stop working. 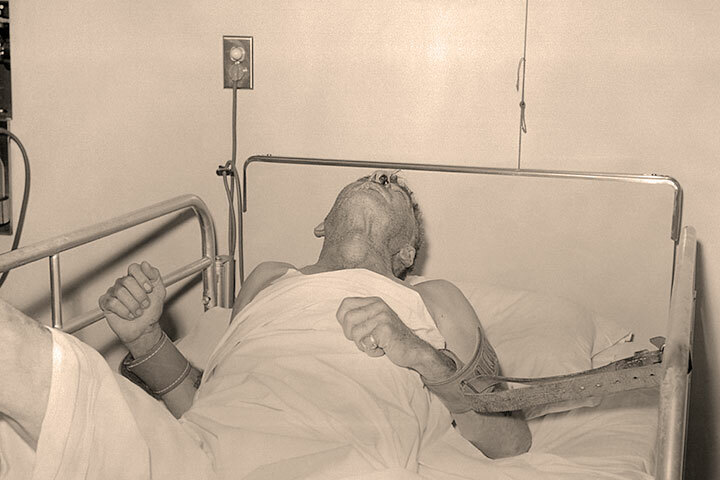 Rabies patient, circa 1959, now in the excitative (or “furious”) stage of disease progression. Note the arm restraints. 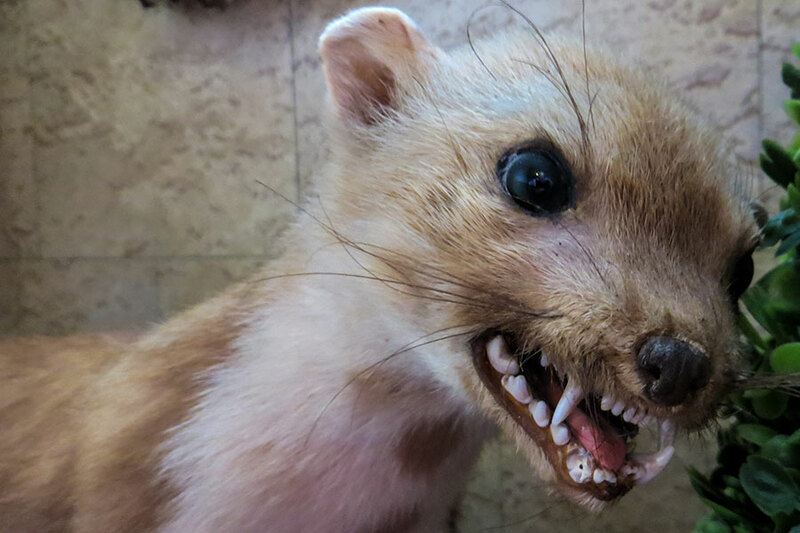 The term rabies comes from a Latin word meaning “madness.” Surely that is one of the reasons this pathogen has always inspired so much fear: for in the process of killing its host, it first destroys the mind, which is the seat of an individual’s personality. Indeed, some of the most familiar and frightening horror creatures in popular culture—vampires, werewolves, and zombies—are derived from mythologies that harken back to the days when a normal, healthy person could be suddenly transformed into a raving, drooling monster just from the bite of a maddened beast. Luckily, as mentioned above, there is an effective treatment for exposure to rabies, if caught early enough, thanks to the vaccine first developed by Louis Pasteur and Émile Roux in 1885. 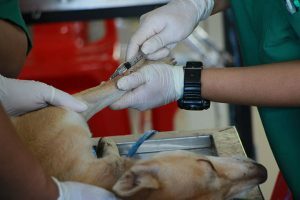 Even better than treatment, of course, is prevention; and we have that too, in the form of vaccine shots for our household pets that veterinarians administer to protect them from rabies infection. That, combined with coordinated oral vaccine-baiting in wildlife areas, has rendered human rabies infection an increasingly rare phenomenon, at least in North America. In the United States, just 1 to 3 human rabies cases are reported annually; and the vast majority of those are caused by coming into contact with an infected bat. Sounds like a success story, right? Well, don’t rest easy quite yet, for a new, even deadlier disease has arisen of late. The medical term is Ignorantia voluntaria—better known as Willful Ignorance. Patient Zero of this particular pathogen was Andrew Wakefield, the discredited former physician who published a fraudulent paper (now retracted) that claimed the measles-mumps-rubella (MMR) vaccine causes autism in children. Despite being quickly refuted and demonstrably proven false time and time again, this claim has continued to spread like wildfire among anti-vaccine proponents. Just like disease-causing microbes, the disease of Willful Ignorance does not recognize national boundaries or restrict itself to any particular creed, social class, or political party. It is an equal opportunity malady, as likely to infect a left-leaning hipster or a right-leaning anti-government libertarian. And as with other nonsensical, unscientific beliefs—such as those held by flat-earthers, chemtrail conspiracists, 9/11 Truthers, and the like—no amount of logic, reason, or fact seems capable of dissuading them from their folly. Indeed, the more credible the proof to the contrary that is presented to them, the more tightly they cling to their misinformation and the more enthusiastically they refuse to vaccinate their children. Widespread vaccination throughout the world—one of the greatest public health achievements in human history—brought about a massive decline in dangerous diseases like measles and polio. 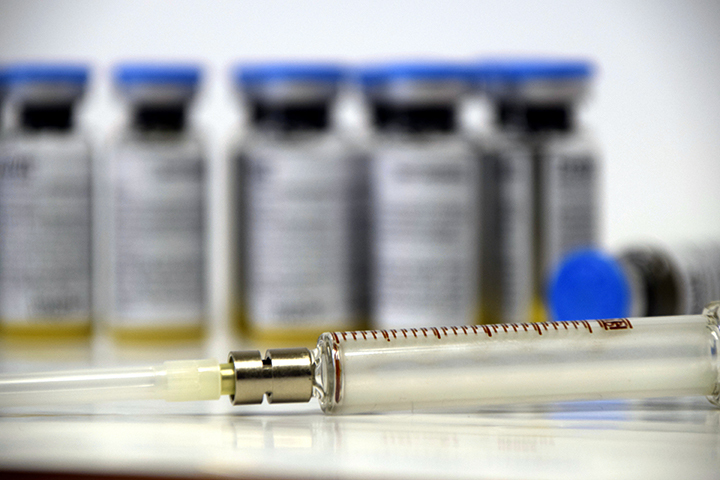 Now a growing number of parents insist on delaying or forgoing vaccines altogether due to a misunderstanding of the effectiveness, safety, and necessity of vaccination. And this has occurred with entirely predictable results: reports of outbreaks of once “conquered” diseases seem to appear almost daily in the news these days. In France, which has among the lowest MMR vaccination rates in Europe, thousands of measles cases are reported each year, with high rates of hospitalization and even deaths—most of them children. In the U.S., well publicized outbreaks have occurred in the states of New York, Oregon, Texas, Michigan, Missouri, and Washington. It should come as no surprise that these cases are “clustered” in areas with relatively low vaccination rates, which defeats the whole purpose of conferring so-called “herd immunity” to protect everyone in the community. Thanks to the Willful Ignorance of anti-vaxxers, 2019 is shaping up to be one of the worst years for measles in a long time. But wait, it gets worse. The human affliction of Willful Ignorance now threatens to jump the species divide into the animal world. Believe it or not, there are now “dog and cat anti-vaxxers.” They are the vanguard of a growing movement of pet owners, breeders, and even veterinarians who oppose the standard recommended inoculations—including those that prevent rabies. These pet anti-vaxxers repeat the same unfounded mantras about animals and vaccines that have been made about children and vaccines: that inoculation is unnecessary, it is ineffective, and it can cause canine autism along with other disorders. We have no words. Never mind that there is no such thing as “canine autism,” which is just a preposterous notion. This is an extremely dangerous movement on the face of it. Not only does refusing vaccinations jeopardize the animal’s health, but it also poses a risk to humans. For example, many of the core shots that dogs receive, like those for rabies and hepatitis, also protect humans from contracting those same diseases. 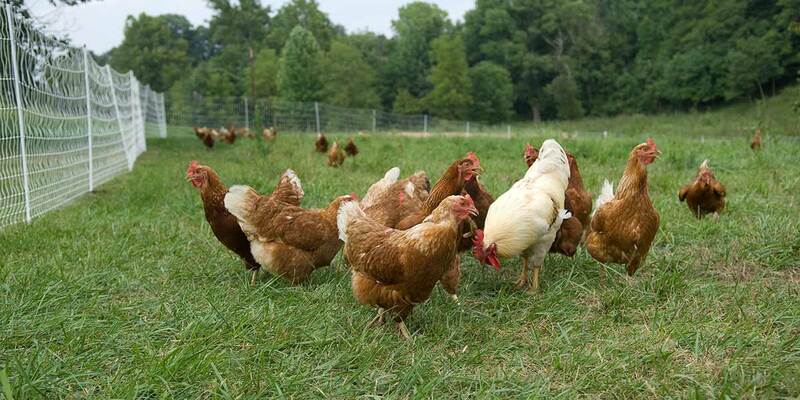 They are considered “core” because of the diseases’ transmissibility to humans. Unless you wish to return to the days of the early 20th century, when 100 or more rabies deaths were reported every year and countless animals euthanized to prevent rabies pandemics, please do not fall for the pet anti-vaxxers’ propaganda. For the sake of you, your family, and your pets, always be sure to get them vaccinated regularly and on schedule according to local regulations. And then let your pets wear our Ketchum Mfg. rabies tags proudly!